The Mobile County Public School System is weighing an idea to convert Murphy High School into an “open zone” school — opening up the midtown institution to children across the county while limiting the population based on academic performance and conduct. 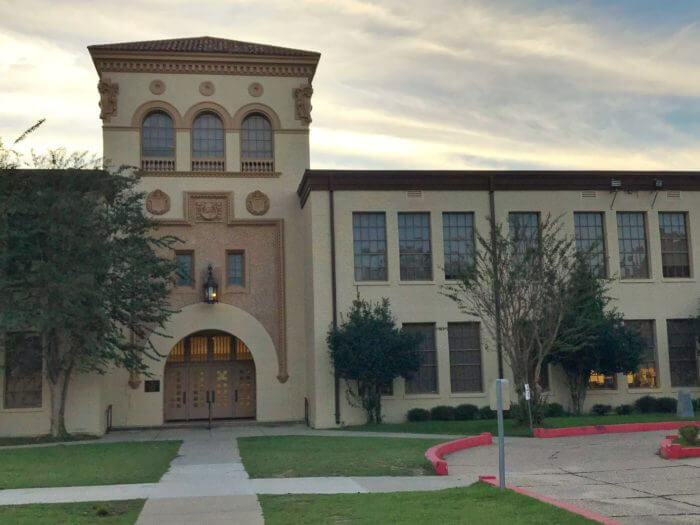 While no proposal has been finalized, school officials believe repurposing Murphy as a school focused on college prep could attract students throughout the district while diverting others to schools in the heart of Mobile plagued with stagnant or declining enrollment. According to the Alabama State Department of Education (ALSDE), just over 1,800 students are currently enrolled at Murphy. While that might be low historically, there were only a few more than 2,000 students at Murphy in 1996 and just 2,130 were reported in 2000. Murphy High School could be come an “open enrollment” school in the near future. What has changed more than the size of the student population are the demographics of the school and its surrounding communities. 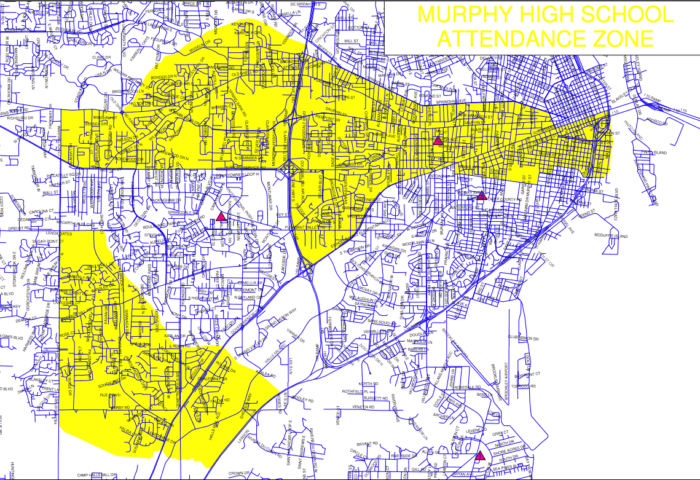 Today, 76 percent of Murphy students are black, whereas the majority of residents in midtown and downtown are white. While that issue hasn’t been directly addressed by MCPSS, it hasn’t been too far from the surface, either. Ryan McKee, a board member of the Murphy High School Alumni Association, recently said the school’s demographics were “starting to not necessarily represent the demographics of the neighborhood.” School Commissioner Robert Battles, whose district includes Murphy, made similar observations when speaking to Lagniappe, though his commentary was more pointed. However, McKee insisted this isn’t a “black and white issue” for Murphy alumni, citing long-standing concerns about the declining student population and a waning interest in the school within the communities traditionally sending students there. According to McKee, there have also been concerns about disciplinary issues at Murphy for some time — a point emphasized the day after last week’s public interest meeting when Mobile police responded to reports of a Murphy student bringing a gun onto campus that was then stolen by a classmate. A teacher “found bullets on the ground in a breezeway” the same day. Documents produced by MPD indicate the department has dispatched officers to Murphy’s campus on hundreds of other occasions over the past few years including 254 times in 2014, 200 times in 2015, 236 times in 2016 and 131 times this year including the incident last Friday. Since 2014, the reports indicate eight incidents where a weapon was reported on campus, 20 calls in response to reported assaults and 17 drug violations. 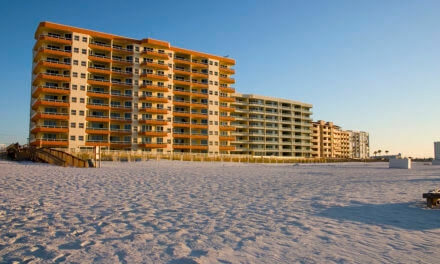 However, a number of responses stemmed from things like traffic obstructions, minor accidents and aborted calls to 911. While there does appear to have been some improvement in that area over the past year, McKee said reports like those can turn away residents considering local schools for their children. When asked how alumni might view limiting enrollment, McKee said a more pressing concern is that 10 years from now, Murphy “wouldn’t even be a viable option” for some families with multiple generations of Murphy graduates. As discussed, the proposal for Murphy would cut the student population to about 1,500. While it’s unclear what the final entrance standards could be, parents were asked at a meeting last week to consider a minimum GPA of 2.0 and a conduct history with no more than two suspensions. Several in attendance suggested that criteria wasn’t rigorous enough. Attendance will likely be determined by a lottery among qualifying students, though there have been some discussions about offering current Murphy students a weighted place in that lottery or potentially grandfathering in upperclassmen whether they meet the criteria or not. Peek said a change at Murphy could be yet another step in the Signature Academy program, which has established specific educational trajectories at all 12 Mobile County high schools where students can transfer to enroll regardless of what school they’re zoned to attend. Murphy’s signature academy is focused on international studies, while a partnership with The University of Alabama has created an early college program at the school offering freshman-level courses in a semi-collegiate setting at no cost to students. So far, the curriculum discussed in the Murphy proposal emphasizes college preparation as opposed to the more career and technical focus seen at some of the other MCPSS signature academies. With two public input meetings in the rearview mirror, MCPSS is preparing to present a finalized proposal to the Board of School Commissioners, which will give the final approval to any proposed changes at Murphy. Despite his concerns, Battles said he’d listen to the public and consider anything presented to the school board with an open mind. He added there’s a possibility that changes at Murphy could positively impact other schools in Mobile’s inner city. If the current Murphy school zone is redrawn, students uninterested in the new program or who can’t meet the enrollment criteria will likely be diverted to area schools such as Williamson High School. Currently, Williamson has 771 students including the 264 middle schoolers who were relocated from Mae Eanes when it was closed in 2016.